I love the ages from nine to twelves years old, the tweens are fearless. They find excitement in every thing they do whether they are exploring new mountains, dreaming of taking a hot air balloon up to the highest peak or want to design sustainable fashions for their friends. It is this age that is forgotten. We as parents have photographs of our babies as they grow and then their senior year as well as large milestones in their life. But these years are just as important to record. Recording birthdays, hobbies, and friendships will fill the gaps in-between the beginning years and their wedding day (if they choose to marry). I love their fierce thirst for exploration, the laughters, the friendships made and their growth of these years. Servicing The Creative Dream in Portraits For More Than A Decade. 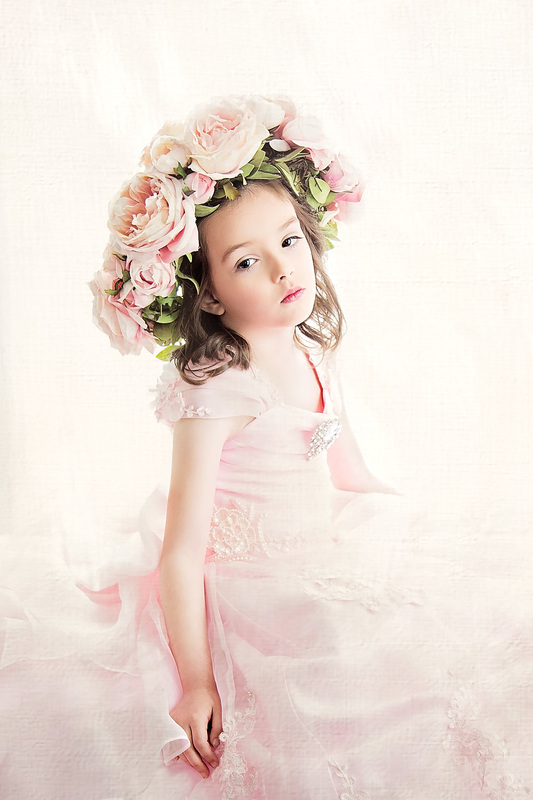 Many of our clients request that I provide the styling for their dream sessions. It has been a labor of love for me as I have taken the utmost care to find just the right designers for our couture sessions. Accessories and specialty pieces are a collective of in house design and sending the design out to our favorite creative Jennifer. She is a Mother of four beautiful children and a designs for the children of the stars. We adore Love Baby J Couture. She has filled our closet with amazing pieces from the frocks to the sashes and sparkly pins that adorn each girl. We searched far and wide for our premier accessory designer for our theme sessions. This mother and daughter team is extraordinary and hale from Australia, Arabella’s Vintage Wardrobe. Not only do our wall portraits provide a link from the child’s experience it provides a timeline for the generations to come to make a connection to their ancestors. Imagine 75 years from now your child’s children’s children walking into their home seeing the dream portrait and asking her, “Who is that pretty girl in the portrait?” She would then relive the dream session by telling her-story or how their great grand-parent took them to a portrait artist who took their portrait. She would relive the smells, feelings and the full experience giving her a youthful feeling yet again. And ending the story with “and someday this portrait will be yours.” That is not something you can give with a USB or a digital download. Are you looking for a unique experience for your tween for their birthday? Our Portrait Parties are amazing! Whether your tween has dreams of winning the vince lombardi trophy or designing fashion for a famous fashion house we have every detail taken care of. You and your tween decide the theme, how many friends from as little as 2 to as many as 20 we have that all figured out. We work with you to make your planning stress free, matter of fact we take care of all the planning, decorating, and more. Want a simple friend session, we have that covered. Want to create a scene from Harry Potter or another theme favorite we have that covered too. You show up, grab a seat and prepare to giggle with them. Anyone can take a picture but it takes a special kind of artist to capture everything a person is, with the special kind of experience Melissa gives you! This was Courtney’s photo shoot reveal! These photos tell the story of her care free personality, her zest for life, her inner and outer beauty! This is the summer before her freshman year of high school. Though we can never have that time back it will forever be memorialized in these photos and the same will happen when she graduates from high school! I don’t just want senior pictures I want her personality and all of the memories that went with the 4 years of high school forever in portrait! Twice a year we host an amazing tween event in which girls and boys come to join us for a theme shoot in a group introductory price. Our tweens meet other tweens who they may not know and forge friendships that can last a lifetime. A theme is chosen according to the time of year. If you would like to receive information about our 2018 Winter Theme during sparkle week in Freeport, Maine sign up for our Newsletter. Sparkle week info will be going out in September it will be Spark-tacular!